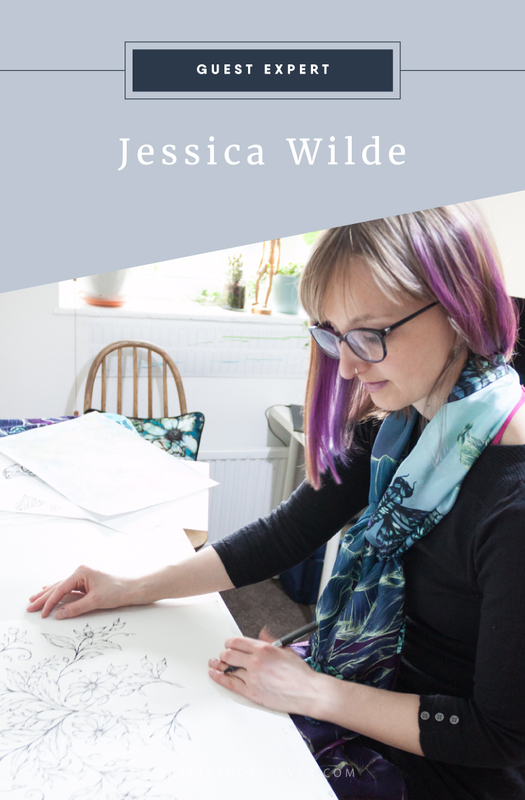 This month we have the privilege to welcome Jessica Wilde, experienced surface pattern designer, to the Textile Design Lab as our guest expert. Jessica creates unique and eye-catching designs inspired by nature and wildlife, each beginning with hand drawn detailing and combined with an expressive colorful twist. Jessica will be sharing her tips for designing for wallpaper on Tuesday, March 27th in the Textile Design Lab, but she is here today to tell us more about her work and her thoughts on the wallpaper industry. Can you remind us of your design background and tell us a little about what you’ve been up to since your last interview this past fall? 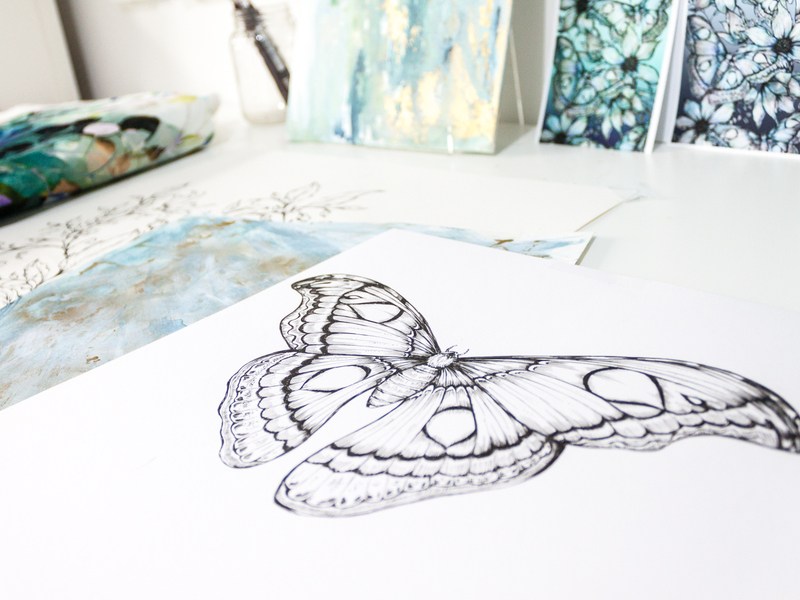 I’m a freelance surface pattern designer and have my own brand of botanical inspired fashion and home accessories, as well as gifts and stationery. 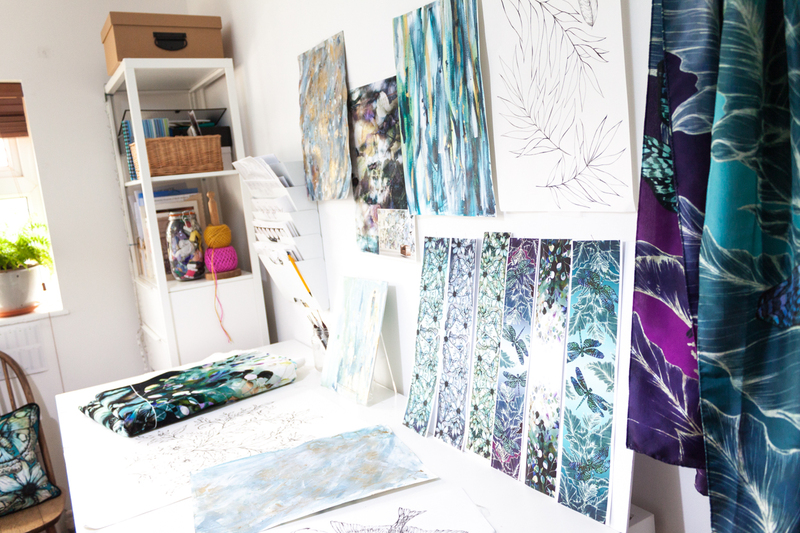 I graduated from Textile Design at Birmingham City University in 2008 and got a job as wallpaper designer for a manufacturer. I worked on domestic and contract ranges, alongside designing for client commissions for various hospitality and retail projects. In 2013 I went freelance and started designing for a wider range of products, sold designs via print studios, and have steadily been growing my own product range. It’s been a busy few months since last Fall, I’ve been working on a range of client projects which has varied from wallpaper, plant pots to Christmas baubles! I have a trade show in May and I’m developing new additions to range for that. I also finish my MA this summer so making the most of the final few months, planning future collections and growth for my business. Your designs are highly detailed. Could you tell us a bit about your process in developing your patterns and how much time is put into a finished design? I usually draw motifs individually or in small groups, I find this suits for scale and keeps the design process very flexible. I then repeat in Photoshop, often with smart objects, layering with textures and colour. It’s hard to say how long the designs I do for my own ranges take, it can be a lengthy process of experimenting, testing and colouring for products, but for a stock designs being sold outright I’d generally work to average of a design a day. What do you notice buyers looking for in the wallpaper industry? Are there industry standards for designers to keep in mind, certain subject matter or colors that are more sought after, etc? Some designs always sell well such as damasks and florals, they just get updated or reworked in some way. Wallpaper repeats are normally 53-64cm square and need to be very well balanced, any oddities will obviously stand out on the wall. A half drop repeat tends to be preferable for this reason, and it’s best to check designs in a room set to scale and test in black and white as this highlights any issues. It’s also good to show how usable a design is by presenting it with a light and dark colourway, this can also be an opportunity to show a commercial colourway alongside a more eye-catching showstopper. Digital has changed everything, a decade ago you had to stick to a standard repeat and limited colours, but now we’re seeing large scale motifs and super-size repeats that span multiple drops or fill a wall entirely. This has been around for a while, but digital wallpapers have become increasingly sophisticated and high end. Some of the big brands are including a digital murals as part of their conventionally produced ranges, or companies specialise purely in digital. This saves on outlay, reduces risk, production constraints, and in turn offers us some really exciting design opportunities. Design wise we can have several trends going on from luxurious maximalism to almost the complete opposite of minimalism and a return to nature. For my MA I’ve been researching the emergence of biophilic design and how nature in interior design can impact on wellness, something I think will only continue to gain momentum in the coming years. 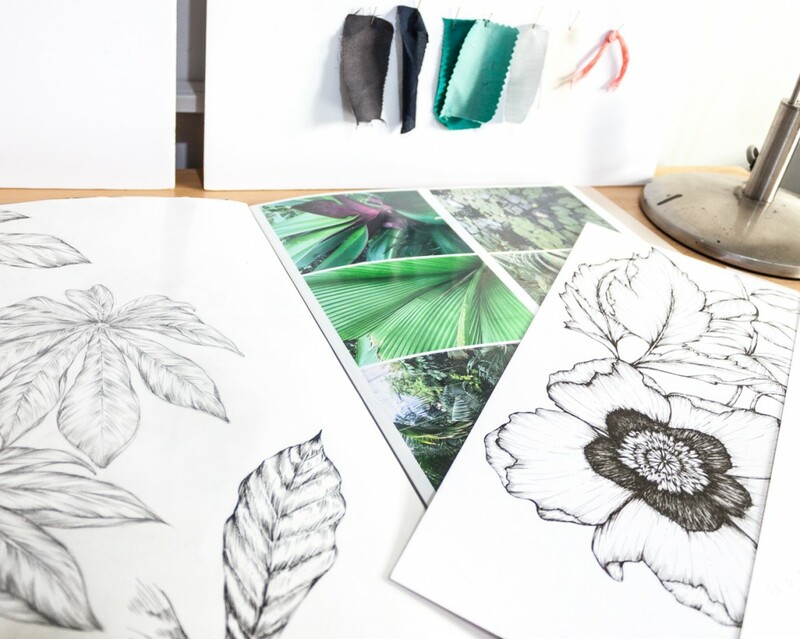 Can you tell us a bit about the production process for wallpaper? How do these production needs affect the way you design? Wallpaper can either be produced conventionally or digitally, the latter has unlimited colours and the setup for this suit lower quantities, though is more expensive to print. There are very few limitations to your designs, you can really let your imagination run and create art for walls. Conventional production requires tooling in the form of a print cylinder or screen, one of which is required per print colour. The setup is more expensive and colour is limited depending on print process, this can vary widely from 3 to as many as 20 with some manufacturers, though the more colours the more costly it is to produce. This suits mass production and the designs tend to be much more commercial, with the end product being cheaper. When designing it’s best to have an idea which method would be used and what market it would suit, making it workable for mass production makes the design more sellable. What do you love most about designing wallpaper and what are some of the challenges? I love it when you see your designs on the wall, it can be a fab surprise sometimes to find them when you’re out and about or spot them launched by your favourite brands. The repeats can be a real challenge, some designs just work, and others can be a total headache. You can also forget what scale you’re working at, either going to big or small, and you have to remind yourself it’s got to be something you can live or work with when it’s on the wall. Do you have any tips or resources to share with surface pattern designers who are looking to develop their own wallpaper line? Where did you begin when you were starting your line? First think about how you intend to produce the range, conventional tooling will strongly determine the design process and outlay costs involved. Digital is more flexible but needs marketing at a higher price point. Contact your local manufacturers for options, finally don’t forget about licensing if you prefer to leave the production side to someone else. For me, my designs and budget decided it, I use far too many colours and enjoy the creative freedom digital offers. We’ll cover the different markets within the wallpaper industry you can design for and the different production methods to keep in mind. I’ll also cover how best to set up your files, standard repeat sizes and share advise for selling to the industry. Textile Design Lab members can find a link to Jessica’s Live Training in our Member Dashboard. Not a member? Get started here. Thank you for this interview. It’s a field I would like to know about a bit more, so I’ll forward to Jessica’s training in the lab! Thanks very much, really enjoyed this interview. Looking forward to the training day with Jessica Wilde. I love the Textile Design Lab, I have learnt so much since joining over a year ago, it’s amazing, and the course tutors are brilliant!